Trusa tubulare antifurt - ZT-008A62 - SMANN TOOLS. 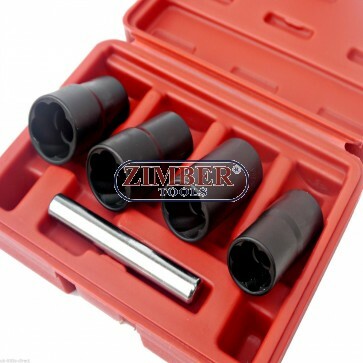 Trusa tubulare antifurt - ZT-008A62 - SMANN TOOLS.Dimensiuni: 17-mm, 19-mm, 21-mm, 22-mm, Extensie - 1/2, Impact.5pcs Twist Socket Set 1/2” Drive Wheel Lock Nut Remover /Removal 17 19 21mm 22mm.Specification:Product Name: Twisted Socket Drive Size: 1/2in.Twist Socket : 17mm.Twist Socket : 19mm (3/4").Twist Socket : 21mm.Twist Socket: 22mm.Straight Rod: 12mm.Application: For removing worn or damaged nuts. Trusa tubulare antifurt - ZT-008A62 - SMANN TOOLS.Dimensiuni: 17-mm, 19-mm, 21-mm, 22-mm, Extensie - 1/2, Impact. 5pcs Twist Socket Set 1/2” Drive Wheel Lock Nut Remover /Removal 17 19 21mm 22mm. Application: For removing worn or damaged nuts.